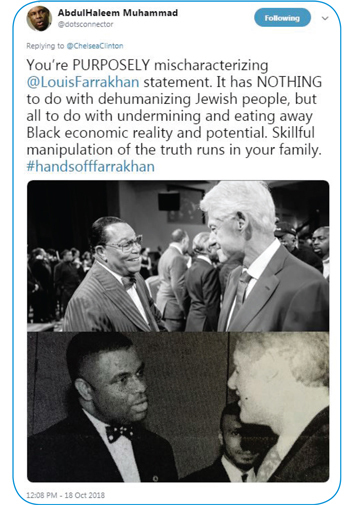 The Zionist Jews and their imps are at it again on social media and mainstream news with relentless, unfounded attacks against the Honorable Minister Louis Farrakhan of the Nation of Islam. During his Holy Day of Atonement message delivered Oct. 14 at the Aretha Franklin Amphitheater, the beloved Muslim and world leader confronted head-on those Whites and Jews who hate him and have deceived Blacks. “So when they talk about Farrakhan, call me a hater. You know what they do … call me an anti-Semite; stop it! I’m anti-termite,” said Minister Farrakhan. His haters came out on social media, but those who defend Farrakhan responded as well, saying the attacks, lies, and disrespect of this man with a pristine, in fact, divine character will not be tolerated. “I think that’s what the attacks are for is to isolate him. The thing that always has puzzled me is those Jewish organizations that attack him, and I refer to Zionist organizations specifically, why aren’t they attacking the people that marched in Charlottesville?” asked Professor Ray Winbush of Morgan State University. He was referring to the violent August 2017 Unite the Right rally in Charlottesville, Virginia. A major Twitter attack came from Chelsea Clinton, daughter of former President Bill Clinton and former Secretary of State Hillary Rodham Clinton. She tweeted a clip of Minister Farrakhan’s address to her 2.38 million Twitter followers, saying it was wrong, dangerous and anti-Semitic. Minister Farrakhan’s supporters say most Blacks aren’t fazed by the attacks and they haven’t diminished his support. And, they add, the Minister never called Jews termites. According to Jesse Muhammad, social media director for Minister Farrakhan, not a day goes by when he is not attacked online, because the enemy wants the Minister banned from social media. But there are also daily efforts to defend Min. Farrakhan and spread his message of truth. Rep. Al Green’s (D-Texas) comments and others on Twitter regarding Min. Farrakhan were met with swift responses from members of the Nation of Islam and supporters of Min. Farrakhan. Among the latest attackers are groups like Christians United for Israel and others from various parts of the country and world—even from as far as Israel, according to Jesse Muhammad. When those who defend Min. Farrakhan respond with intelligence, truth, actual facts and dignity, the enemy responds with curse words and even death threats, he noted. “This is evident that the Minister must have sprayed some form of termite repellant that stirred up those that have practiced and continue to practice Talmudic ways by eating at the foundation and the carcass of a dead people chosen by God,” continued Jesse Muhammad. 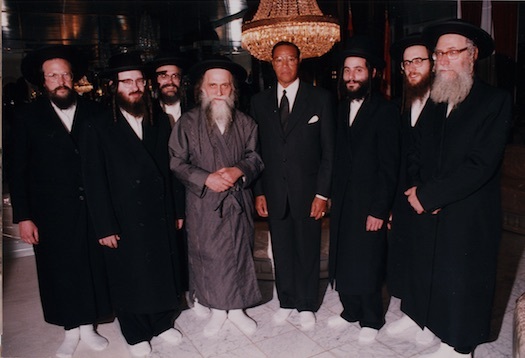 Jewish people cannot produce any Jew that my followers have harmed in 40 years, added Minister Farrakhan. “You haven’t found us defiling a synagogue. Our Qur’an teaches us if we see something like that stop it,” he said. Ants, pointed out Nation of Islam Student Minister Nuri Muhammad, are black, brown, and red and they get along, but there’s also a white ant, which is called the termite. “The termite is the kind of ant that’s white or pale in color, that is like a termite, always behind the scenes, behind the structure, eroding away at the wood that supports the structure,” he stated. “When the Minister said he’s anti-termite, he’s anti-any group of people that will gather their unity together to be behind the movements, behind our organizations, behind our fight for justice and be eroding the very structure that supports these movements. That has been the legacy of the Jews with the NAACP and the Urban League as they stated as part of their objective, we want to make sure that if we fund you that you become a non-economic, liberal organization, which is what they’ve become,” he said. 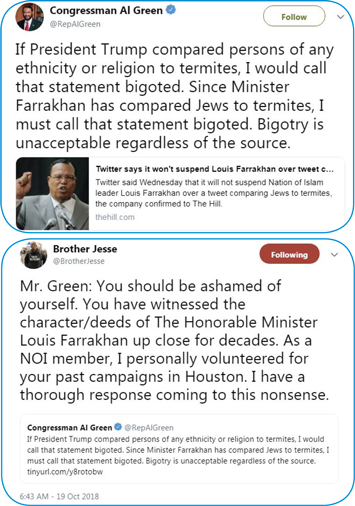 Congressman Al Green (D-Texas) perplexed many when he jumped into the fray, retweeting an article about Minister Farrakhan and accusing the Minister of bigotry. “I haven’t talked to him yet, and I’m trying to be balanced and understand what would cause him to repudiate a friend, someone he has supported and has supported him! What is his reality?” asked Abdul Haleem Muhammad, Nation of Islam Southwest Region student minister. “I would have expected (Rep. Green) to call me to get clarity or to get the Minister’s quote in its context before issuing a public statement like that,” he added. Jesse Muhammad, who is also from Houston, said Congressman Green should be ashamed of himself. The Black lawmaker faced death threats from President Trump’s supporters and Minister Farrakhan and the Nation of Islam came to his aid, he said. 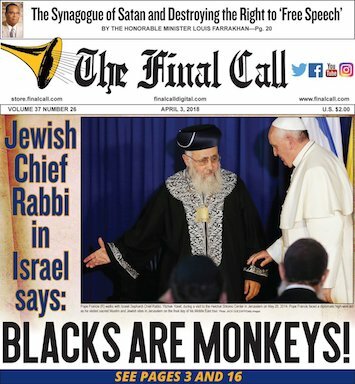 Further, where was all the outrage when a chief rabbi in Israel called Blacks monkeys, or when President Trump’s daughter and son-in-law were blessed by the same rabbi? Jesse Muhammad asked. “I think when it comes to all of this, there’s a serious racist double-standard and the double standard is very clear in the sense that the Jewish community rarely holds itself accountable for its irresponsible behavior towards Blacks,” said Dr. Boyce Watkins, author, entrepreneur and advocate for Black economic empowerment. “You have a music industry where Jewish run record labels are allowed to refer to Black people as niggers but they would never say anything that derogatory about their own people,” argued Dr. Watkins. Final Call Newspaper from April of this year ex- amining anti-Black racism among members of the Jewish community. “You have a music industry that is heavily Jewish controlled that is incredibly disrespectful to Black women, that has promoted mass marketed messaging that has led to the deaths of more Black people that died in World War II than in Nazi Germany. So to some extent, when Minister Farrakhan says he’s anti-termite, he’s talking about the termites in this world, who will either eat off the Black community and give nothing back, or will destroy the Black community and not expect to ever be held accountable, so if he is anti-termite, I am anti-termite. “We should all be anti-termite, and saying that you’re anti-termite only translates to being an anti-Semite if you happen to be one of the termites,” he added. “As a human family we must come together and fight against that oppression. They take that statement and say he is talking about the entire Jewish community and everybody knows that’s not true. Historically speaking, there is evidence that shows wealthy Jews played a role in the Holocaust of their own brothers and sisters, so when the Minister is speaking out against these wealthy small percent of these Jewish men that own 90 percent of the wealth he is not speaking against the entire Jewish community, it is obvious the masses of Jewish people don’t have the power,” he continued. “When you are speaking about termites, that is what they represent, they are termites eating at the souls of those in poverty and that don’t have a voice in the world,” added Mr. Shabazz of the Melanic Islamic Palace of the Rising Sun in Detroit. “I think personally that it is an oxymoron for someone who has inherited their ancestors’ conversion to Judaism to call the original Semitic people anti-Semitic,” commented Sutton Bey, an activist in Detroit who is Moorish American. “The Minister’s comments were directed at a very specific group within the Jewish community. Taken out of context some may think it was a blanket statement on the religion of Judaism. However, those of us who were in the audience were clear about who he was speaking about,” commented Khalid el-Hakim. “Being critical of corruption and evil practiced by so-called followers of Judaism isn’t anti-Semitic. His comments were admonishing them for misrepresenting God’s religion,” said the Motor City activist. Thousands listened to Min. Farrakhan’s address at the venue in Detroit or in other parts of the country via webcast. “Who has time to hate? I just can’t stand it when people say the Minister teaches hate. No, he doesn’t,” said Helen Miller, who viewed the Oct. 14 message from Washington, D.C., at Muhammad Mosque No. 4. “He doesn’t know anything about hating someone because of their religion. Those Jews got it all wrong. Like the Minister said, Jews are anti-Black,” said the retiree. Kevin Dennis watched the broadcast via internet from Nation of Islam headquarters at Mosque Maryam in Chicago. He heard Min. Farrakhan’s observations about Black entertainers and many of their White Jewish managers.